SRG Global provide a complete slipform service and maintain experienced teams of personnel available to assist in all aspects of construction including design, planning, programming and construction techniques relating to the slipforming and formwork methods. The slipform technique is a rapid and economical construction method that can achieve considerable cost savings when compared with the cost of conventional formwork. The slipform construction system becomes viable on regular shaped structures generally four storeys or greater in height, although multiple uses on shorter structures has been achieved economically in the past. 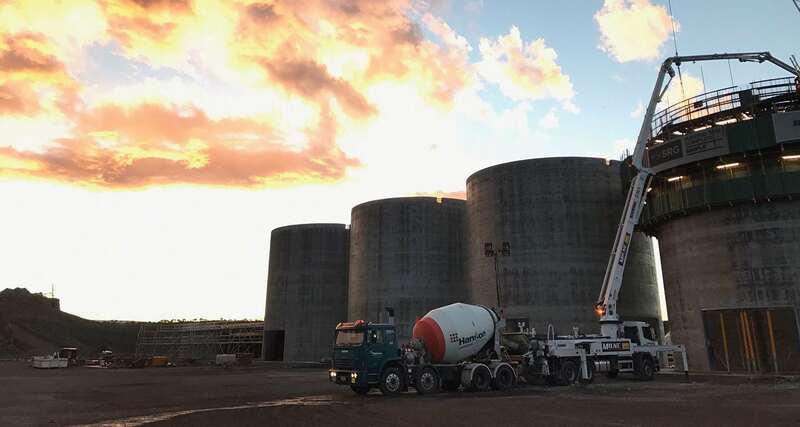 The slipform technique for silo and tank construction is a rapid and economical method that can achieve considerable cost savings when compared with the cost of conventional formwork. SRG Global has extensive experience in the Slipform construction of tanks and silos throughout Australia and internally. SRG Global has completed a number of dam projects utilising slipform technology to form dam spillways as a fast and econimical alternative to alternative construction methods. Tapered slipform is required for the construction of conical chimneys, cooling towers, piers and other tall concrete structures involving constant or changing thicknesses in walls, diameters and / or shapes. SRG Global has been involved in the construction of tapered towers and chimneys from 50m to 275m high, with diameters changing from 25m to 6m, and wall thicknesses changing from 700mm to 250mm.